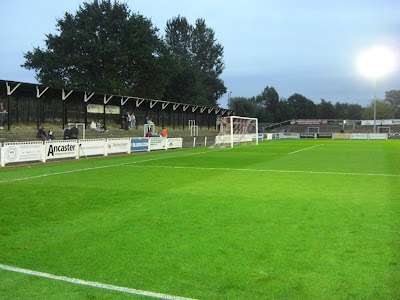 My sixteenth stadium of 2012 was on Tuesday 4th September 2012 at Hayes Lane in Bromley, London. The match was Bromley vs. AFC Hornchurch in Conference South. Hayes Lane is part of a sports complex located close to a built-up residential area in south London. 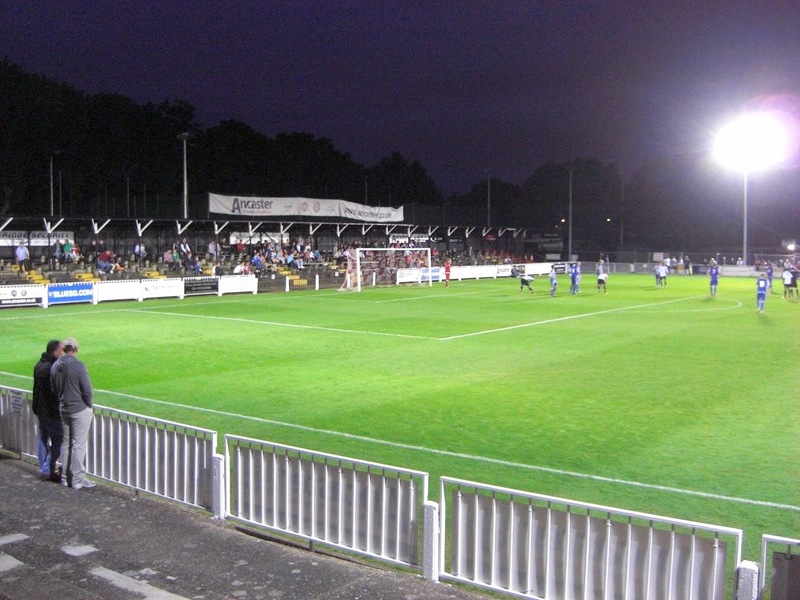 The ground is just under a mile from Bromley South railway station and has been home to the club since 1938 although they did have to vacate the venue during the 1992/1993 season after damage caused by a fire. Hayes Lane is also home to Cray Wanderers FC who have played at the ground since 1998. The John Fiorini Stand sits level with the half-way line on the western side of the ground and was rebuilt in 1993 after the previous wooden stand burnt down. It can seat just over 300 fans and also contains the players dressing rooms. The rest of this side of the ground is uncovered standing. Opposite this is an uncovered terrace which extends along the entire eastern side of the venue and provides good views of the action. The area behind the goal at the northern end of the place is more terracing which is mostly uncovered save for a small covered section at the back. The area behind the other goal initially had the same set-up of terracing with a small covered section at the back but the the club then decided to install numerous rows of wooden benches upon concrete blocks to turn it into a unusual seated structure. The game saw an explosive start for Bromley as they raced into a 3-0 lead in the opening 22 minutes. The first of these came in the 4th minute when Richard Pacquette made a good run down the wing before crossing into the box for Pierre Joseph-Dubois who tucked the ball home from close range. In the 11th minute a Bromley corner was swung into the box and was guided into the net with a bullet header from Pacquette. Just over 10 minutes later it was 3-0 as Hornchurch failed to clear a corner properly and Joseph-Dubois sprung clear of the defence to lift the ball over the keeper. Bromley continued to play excellent passing football for the rest of the opening period as Hornchurch found it difficult to get out of their own half. It didn't take long into the second period for the 4th goal of the game to come. In the 52nd minute another Bromley corner caused problems in the visitors defence and when the referee spotted a push he pointed to the penalty spot. Pacquette dispatched the penalty for his 2nd of the game but this marked a turning point in proceedings as Hornchurch then seemed to sort themselves out and for the remaining 40 minutes they certainly matched Bromley. In the 85th minute the visitors almost got a consolation with a header coming back off the crossbar but it was not to be and the match finished 4-0.